Though I generally don’t encourage “medal-seeking behavior” – that is, behavior that forsakes objectives to get medals – I do realize that it is a mechanic that we have in the game, and it would be good for people to learn how to most effectively obtain medals. I will talk about the system, how to understand it, and how to use it to the advantage of your gearing-up process and your teammates. Medals are essentially rewarded for completing certain goals in a warzone. Some goals are obtainable by everyone, such as defender or attacker medals, and some are available to only a few people, like protection medals, which are only obtainable by tank classes. So what do medals do for you? Medals increase the number of warzone commendations and valor that you earn at the end of the warzone. Every medal gives you five warzone commendations and 250 valor on top of the base amounts that winning or losing gives you. The rewards from warzones only kick in if you obtain one medal. If for some reason you do not get the one medal (for example if you backfill a warzone at the very end of the match), then you will get ZERO rewards. The good news is even getting one attacker point or one defender point will give you a medal, so pretty much doing anything will give you a medal. Rewards from medals are capped at eight medals. You can get more than eight medals, but doing so is purely for ego’s sake. Again, these colors mean absolutely nothing except for ego. The general goal is to get to Silver, but only because that is eight medals, which means you will get your full rewards. Depending on how many medals you get without dying, you can have an announcement made about you to the entire warzone. It comes in the form of “Geldarion is Unbeatable!” or something of the like. To get these announcements, you have to earn the following amounts of medals in one living streak. Though unrelated to medals, it bears mentioning what MVP votes are. At the end of every warzone, you are able to vote for one person on your team (aside from yourself). Doing so will slightly increase the rewards for that person. Typically, I will vote for people that did exceptionally well at their job. This includes tanks, healers, AND damage classes. Here are some of the things I look for. Healers that pass or approach 500k healing, tanks that do more than 40k protection, and DPS classes that do 300k+ damage all are good candidates for me to vote for. I also look at objective points and see if there is someone worthy that did a lot for the warzone fight as a whole. I will almost always vote for the person who sits at a turret and calls incs well. People who let the turret get ninja’d never get a vote from me. People who were helpful and/or took charge in a good way also get my vote sometimes. Someone who disarmed a bomb in Voidstar will get a vote for me, if I can tell who did it. People who pass and get ahead for passes in Huttball are on the top of my list. If I am in a guild premade or in a Ranked warzone, we have a habit of arranging the table from highest medals at the top and lowest medals at the bottom, then voting for the guildmate immediately above us. The top person then votes for the bottom person. This ensures that every guildmate gets a vote. It doesn’t really matter how you organize it, as long as it is agreed upon beforehand. Overall, votes don’t really matter, but they can improve your faction bit-by-bit. If everyone votes, that is more commendations in the pockets of possible future teammates, which means they will have better gear the next time around. Vote for the sake of your faction, even if you don’t like anyone you played with. There are several different categories of medals. These are earned either through the use of the Guard skill or through taunting other players. NOTE: These medals are only granted to the winning team. How Do I Get Medals? So now that we have a comprehensive list of medals that are possible, how do we get them? Remember, only eight are necessary for full rewards, but if you are totally stomping the other team, then by all means try to get more! DPS classes specialize in damage, obviously, so the first choice is to go for the damage-based medals. Pretty much all DPS classes are capable of getting the killing blow, 2.5k hit, and 75k total damage medals in every single warzone. The kill-total medals are usually achieved, especially in longer warzones. The Soldier medal is a little difficult at 25 kills, and even the Commando medal at 10 kills can be difficult depending on how many healers are on the other team. Generally, depending on where you are fighting, DPS classes will have no problem achieving the objective points medals. At an objective that you are defending, such as a friendly turret, just spending time in the area grants points. You are also given points for every kill that involves you. Special circumstances can produce a few more medals in addition to the standard ones above. 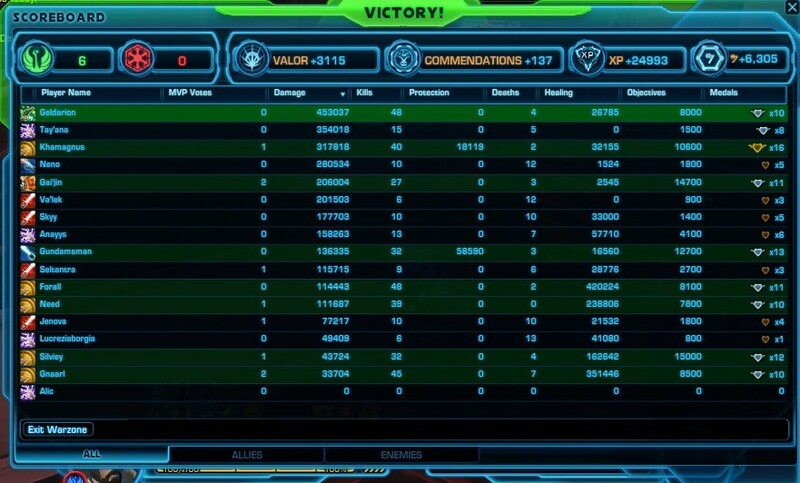 A good performance against a team with a lot of healing in a long warzone will usually net you the Destroyer (300k) medal. If you strike out on your own for some reason (not recommended most of the time), you might grab the Assassin medal for a solo kill. Landing a critical hit on an unprepared light or medium armor player with an already hard-hitting skill will sometimes result in a 5k+ critical hit. Gunslingers and Snipers are currently capable of obtaining the 2.5k heal medal using Cool Head/Adrenaline Probe while in Saboteur/Engineering spec. I believe the medal may be counting the entire skill as one heal, and it has to crit. I have also reached the 75k healing medal as a Gunslinger once while in a particularly rough warzone. All healing classes have DPS specs, so they will obviously be able to get the medals from the DPS section if they want to, but for healing specifically, here are some tips on getting the healing medals. The 2.5k heal and 75k total healing medals are almost certain for a healing class. In fact, the 2.5k heal medal is a pretty standard one even when specced DPS if you cast your heal on yourself occasionally while fighting. It is not uncommon even in short warzones to reach the 300k healing mark as well. The Trauma Surgeon (5k heal) medal is especially easy to get on players that take incoming healing boosts in their talent trees, which not all do. Another, little-noticed fact is that most of the time, if anyone gets the Commando or Soldier medals, the healers generally do as well. This is because an enemy killed by a player receiving heals counts towards the healer’s kill total. The tank classes have the easiest time getting the eight medals required for full rewards. Even while DPS-specced, tank classes have access to their taunts, which make enemies do 30% less damage to players that are not you. In a big bunch of enemies, popping off your AoE taunt in the middle of them can get you two or three medals almost instantly if they are targeting someone besides you. In fact, the protection medals are the only medals that are easier to get the better your opponents are geared. Their hard hitting skills will add more points to your protection score, making it more likely that you will get all of that protection in one life. Guarding friendly players is the other way to get protection points. Without a lot of shield rating, absorption rating, or health, you could die before you get the 10k protection in one life medal if they are really focusing your guarded target. Here are some tips to remember, regardless of your class. Use off-spec skills, i.e. heals for damage-specced healer classes and taunts for damage-specced tank classes. This not only contributes to your team, it also racks up additional medals. Pay attention to objectives. Attacker and Defender points will start flooding in if you pass the Huttball to teammates; prevent captures of turrets, doors, and pylons; kill ball-carriers and orb-carriers; and guard an objective without getting pulled away by sneaky people trying to ninja a node. Focus fire targets to get the kill medals when enemy healers are around. Mark and kill enemy healers first and foremost for maximum kills. Learn your class, your offensive cooldowns, and your hardest-hitting skills for that elusive Annihilator medal. Also, take advantage of non-bubbled targets. Again, the main reason the medals are in place is to encourage good behavior. I have found that if you are actively seeking to win the warzone, then you usually get your eight medals AND you win. Just going for medals can get you the eight you need, but it often results in a loss. Because the base Valor and commendations for a win is larger than that for a loss, even if you only get 5-6 medals, you still get more rewards for a win. Plus any win that is under ten minutes racks up additional completion medals.